Florida Fishing in the late summer months and early fall can bring wonderful surprises. Miami is the perfect location to explore some inshore fishing on a Biscayne Bay Fishing Charter. I had the pleasure of fishing with Ainsleigh and Gary traveling from Scotland. While they were visiting this great state and city, they wanted to catch some of the variety of species Miami holds. We had a great trip out on the water. They really enjoyed the scenery and beautiful shoreline that the Bay has to offer. Ainsleigh and Gary caught over 20 quality sea trout. Ainsleigh landed a 20 pound nurse shark and Gary landed a 40 lb nurse shark on 8 pound test line. One of the best remarks I got as they were leaving the boat is that this was their best trip out on the water. We had a blast just cruising around and also catching the numbers and variety we did. Water and weather conditions held up very well. It is always a joy to have the action that we did. We are looking forward to their next adventure to the states for some more of the action here in Miami or the other amazing locations that we offer here. 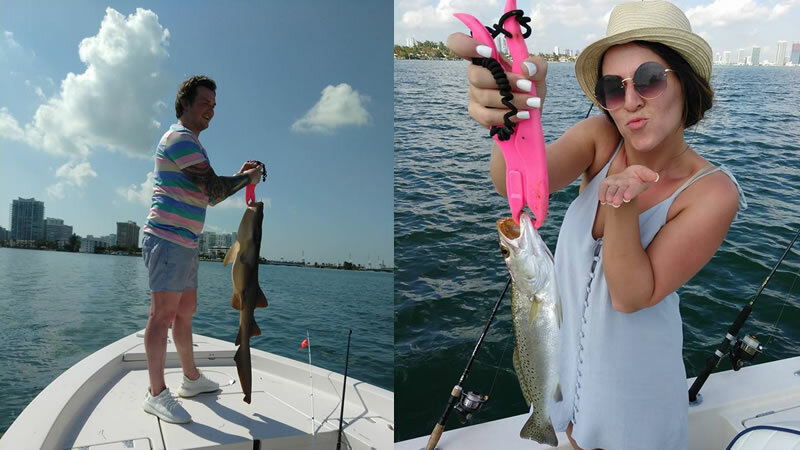 Do not miss out on your adventure to catch these elusive fish that love the waters in Miami. It surely will be the time of your life and you will create memories that will keep you coming back for more. Come Catch Yours Today with Captain Brian Leibowitz in the Biscayne Bay. If you enjoyed this report with Captain Brian, you might also enjoy afishing report from the same area.